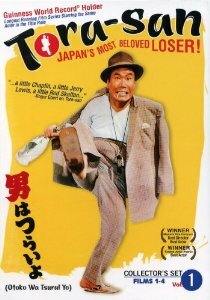 Featuring ATSUMI Kiyoshi as the lovable loser KURUMA Torajiro, the 48-film Tora-san series holds the Guinness World Record for the longest running film series starring the same actor. In a typical story-line from the series, Tora-san visits a different part of Japan where he meets a beautiful young woman, and tells her if she ever needs help, she should come visit him in his small hometown of Shibamata. Japans Wacky Loser Tora-San films creates a fun and laughable experience for your Viewable pleasures. Over all this 4 film set was a good watch. You follow Tora-San throughout his life in the 4 films of the 48 films in total making this the world record. The Character is a fun dumb wacky but lovable guy who Knows at times he makes mistakes. In every film he always runs away but ends up returning in the next film. At the opening scene to every film is also fun to watch as he is walking and always hitting or disturbing someone as he is completely oblivious to what is going on. At some points in the films you feel sorry for him and at other parts you cant help but laugh at or even with him. At first I was hesitant to get the films as I wasn’t sure I would like them. After viewing all 4 films I now wish I could view all 48 but I think that will be a hard task as no one is releasing the rest of the 44 films. The run of these films is pretty crazy as they were being filmed from 1969 to 1995 (wow) and Tora-san is considered to be a national treasure in Japan. I average all 4 films at 4 out of 5 stars and I feel they are fun to watch and if you like Japanese Cinema I would say give them a try, I think you wont be disappointed . The films are filled with comedy, drama, sadness, you know the everyday life stuff. Go check them out and follow Tora-San on his life adventures . The only down side for me was the menu before you watch the film , where you select play. It takes forever to get to the play function. Agreed, I wish they were all for sale in the states. But the Japanese releases were pretty good with the sub-titles, but not as good as the 4 released in the US. I tried to purchase the series on Amazon.jp but I am not willing to spend 1k on them. The cheapest I’ve seen is used around $500. Just read your lovely write up on Tora-san and I just wantd to pass the word that Scare Crow Video in Seattle has 33 of the continuing Tora-san videos on stock for rent. I have seen them all and I can tell you that they are all funny, but you get to see the family grow older, people are slowly added to the over all story line and you get to see Japanese society change from a post-war economy to a power house of the 80s. An other aspect I enjoy is all the places in Japan that Tora visits, it almost feels like a travel guide series. I believe you would enjoy them all.